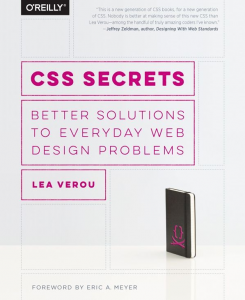 I recently stumbled across CSS Secrets: Better Solutions to Everyday Web Design Problems by Lea Verou. I sure find it to be a good find. This book has 47 undocumented techniques and tips for intermediate to advanced CSS developers, addressing a wide range of everyday web design problems and then discussing ways to get to the solution. All of these techniques definitely triggered some braincells to rethink how I solve CSS design ‘problems’. Using CSS features I knew about and some new ones I’ve learned, in order to come up with DRY (Don’t Repeat Yourself), maintainable, flexible and lightweight solutions, whilst still keeping within web standards as much as possible. One of the most notorious things that can drive any front end developer nuts, is vertically aligning elements within a container. I have been using a few different techniques to achieve this. Most of the time this one by Chris Coyer. From experience I do find it require extra elements that are not always readily available. Especially working with a CMS eg. a custom WordPress theme. There is also this article: Centering in the Unknown, worth reading. I would however like to make a note below, of the clever techniques, discussed in the book, achieving just that. When using percentages in translate() transforms, the element move relative to its own width and height. That makes is possible to get rid of the hardcoded dimensions. After all of this, it also mention in the book, (for obvious reasons, if already using Flexbox) just using Flexbox would be the best, most flexible solution. The above mentioned is just scratching the surface of all the ‘wow’ and ‘aha’ moments coming out of this book. And that is not all… everything in the book, from the layout, the figures to the colours are styled using HTML with CSS. A lot of the figures are also generated with SVG or it use SVG data URIs, generated via SCSS functions. Highly recommended.